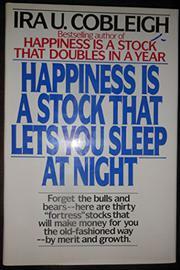 From the author of Happiness is a Stock that Doubles in a Year, simple but sound advice for investors made insomniac by the 1987 crash: put your money into "Fortress Stocks" and ride tight. Eschewing mutual funds, a majority of which failed to outperform the Dow Jones Industrial Average in 1987, Cobleigh recommends that investors "buy good stocks with steady and rising earnings and dividend expectations, and don't try to trade them in and out on short-term swings." The 30 stocks he recommends Will surprise no one: American Express, Citicorp, Coca-Cola, Exxon, McDonald's, Seagram, and Upjohn are among the very big, very familiar names. You probably won't get rich fast following Cobleigh's obvious, common-sense advice, but you almost certainly won't lose your shirt, either.